Indulge in the many options for your soaking and rejuvenation needs. 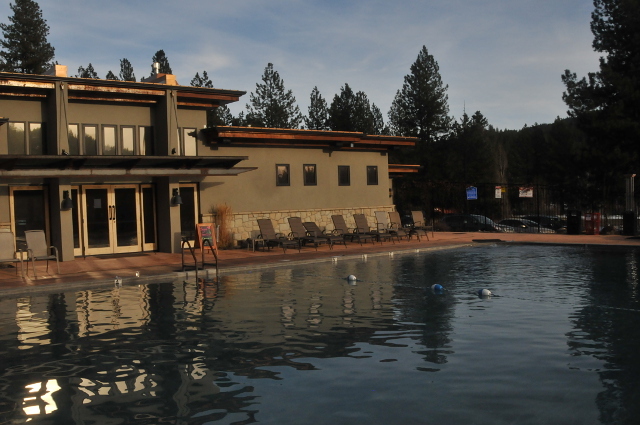 Take a dip in the 40′ x 80′ geothermal pool or for some extra heat, kick back in the 16′ hot tub clocking in at 104*. While you’re there, try out the steam room to find that higher level of relaxation. 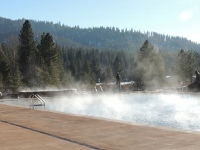 In the summer months play on the splash deck in 16 jets of cold water, extremely invigorating! Grab the fluffy towel and simply relax. While snow is abound and winter temps are chilling, enjoy the ice and snow free walkways. Geothermal water has been pumped throughout, including the changing rooms, to keep those tootsies warm. The main lobby features a cozy fireplace to sit and share stories. Winter months also feature a bonfire at the edge of the pools, allowing warm-up time when you’re not soaking but still want to be outdoors. Intimate lighting follows the footpaths and buildings for easy navigation and a perfect setting for stargazing from the pools. 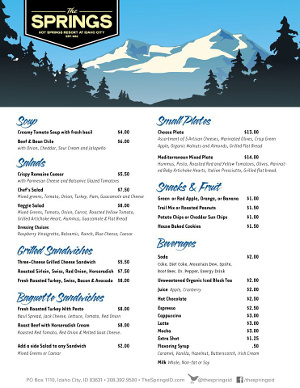 Grab a delicious wrap, sandwich or soup, all made from scratch, at the cafe. Craft beers on tap and fine wines are served poolside. 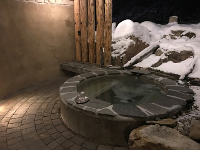 Enjoy professional massage services, including deep tissue table massage in the heated massage yurt, or “Watsu” water massage (Shiatsu massage done while floating in the water). Be sure to also take advantage of the live music offered during the summer. Explore the surrounding beauty of Idaho City, snowshoe or cross country ski or sled downhill at nearby Steamboat Gulch. 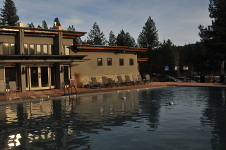 The Springs offers everyone a chance to relax and rejuvenate in a natural atmosphere. Massage is offered on Wednesday and Sunday nights and includes couples massage. A day pass allows unlimited entry and exit all day long, access to hot spring fed showers, personal locker with key, and a plush pool towel. You will find complimentary spa amenities including shampoo, conditioner and shower gel, grooming products, sunscreen and moisturizer. Complimentary herbal tea, organic fair trade coffee and mineral water is offered. Multi-use passes and other discounts available, inquire at the front desk. There are 4 private pools that can be rented by the hour. 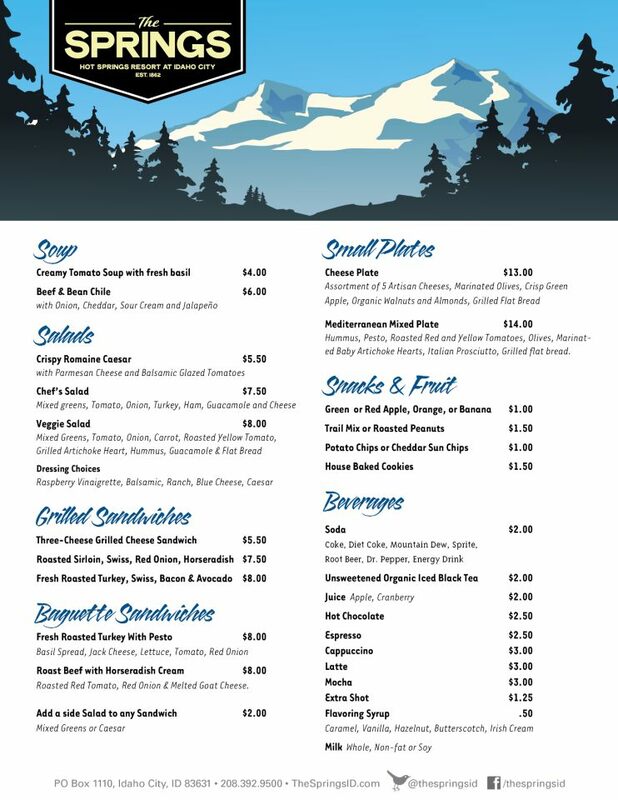 Reservations are mandatory on weekends and highly recommended during the week. Note that The Springs limits the amount of soakers in order to provide plenty of space for everyone. Making a reservation is a good way to avoid being asked to wait or be turned away due to lack of space. A short walk down the road, lodging can be acquired from The Springs' 7-room sister property, Inn the Pines. There are 3 king rooms and 4 double queens including an ADA compliant double queen on the main floor. Lodging is not available directly at The Springs. There are plenty of stellar National Forest campgrounds available in the neighboring Boise National Forest. From Boise, head north on Highway 21 towards Idaho City. Prior to reaching Idaho City, look for the signed turnoff past mile marker 37. Approximate drive time is 45 minutes. You can’t miss it! Check road reports during inclement weather. Soaking the afternoon away in the Idaho mountains. Aerial over of the hot springs and an interview with General Manager, Curt. Nestled in the Boise National Forest on 80 acres of wooded bliss, you'll find a place to soak away your cares and immerse in Mother Nature.